If you are looking for tips on how to lose weight, this is the place to review. We routinely publish tips like this page in the hope that we can help people achieve their goals. You may find that some of the tips work for you while others do not. Select those that make sense and fit your lifestyle. Just remember that the ultimate goal is to lose weight and manage your weight. You have to be serious about losing weight, especially after the holiday season. This is the time to create new habits that will lead to better health and loss of those extra pounds you want to manage. 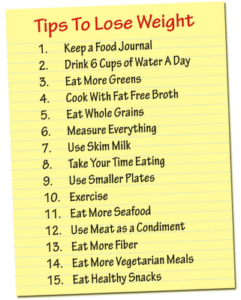 Review our list of tips on how to lose weight and start today towards achieving your objectives. Create new habits by focusing on positive eating situations.